In Kenya, everyone introduces himself or herself. Everyone. Any time our group of 13 students, plus three faculty, plus one student leader, plus at least one driver, plus most likely a Mumias Sugar representative, and possibly plus Cale went anywhere another group of people will have also assembled. We will all introduce ourselves to each other. On a few occasions, during these great introductions, I took note of someone introducing themselves by saying, “My names are…,” typically followed by their first and last name. When thinking about this, it makes complete sense. My name is Sara. My names are Sara Reeves. Obviously. Keys in Kenya are fabulous, as illustrated below. 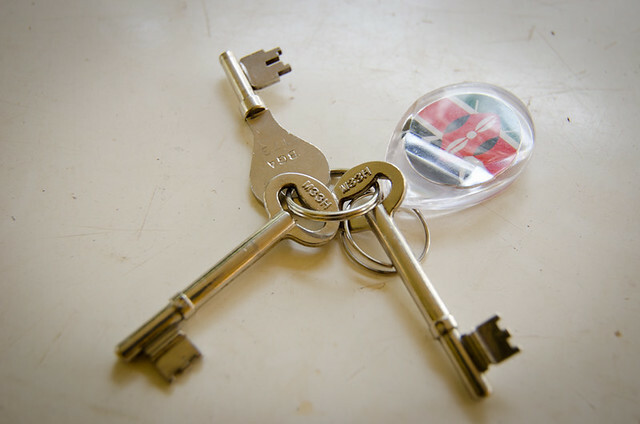 These aren’t just the keys to an old freestanding wardrobe or some sort of treasure chest. These are the keys to your front door (or, in the case of the keys below, to your back door). These are not old or antique front doors either. Stop at any hardware store and you will find brand new locks sporting these keys. So I made a note that the TV is always on in Kenya. However, it has occurred to me that it is likely the TV is always on in the States too. So…nevermind on that. However, I think I have determined why it stands out to me here. The TVs that are on all the time here are also blaring at top volume, whereas the TVs that are on all the time in the US are usually on mute. Whatever brief period of time in the early 2000s that Eve and Gwen Stefani made a song and JLo and Ja-Rule made a song, you know, when Nelly still existed? Music from that period of time keeps popping up randomly. Also, one day we were at this other local guesthouse, Guesthouse 70, and song after song were straight out of the Samoa play list. Maybe there is just a developing world mix CD that contains that Akon song and Beyonce music from five to seven years ago? You know those tiny grocery carts in the US? The ones for kids to push along side their parent so they feel like they are grocery shopping too? Those are just a normal shopping cart option here in Kenya. You walk into a Nakumatt and you are faced with a small selection of what I would consider a normal-sized grocery cart, a small selection of baskets (the kind you carry), and a large selection of the tiny, kid-sized carts. I find it a little hilarious to see all these grown adults leaning over to push these tiny carts around the grocery store. Have you washed your car recently? How about today? And yesterday? And the day before? How about every day at every opportunity? Ah, well then you must be Kenyan. Kenyans LOVE getting a car wash.
Bata is the Starbucks of Kenya. Not that it sells coffee. It doesn’t. It sells shoes. But in any town, it feels like there is one on every corner. In addition, Cale points out that shoes are the coffee of Kenya, in the sense that you can buy shoes just about anywhere, the same way you could pick up a coffee just about anywhere in the States. Speaking of coffee, what is it with the rest of the world and Nescafe? That is nasty instant coffee. I could sort of understand it in Samoa and SE Asia where they do not grow coffee. But they grow coffee here in Kenya and they are right next door to a country famous for its coffee, Ethiopia. Yet coffee in Kenya means Nescafe. When we first arrived we were speaking with a Kenyan who was telling us what nice coffee they had here in Kenya. Cale was excited for some delicious local brew, until she pulled out a bottle of Nescafe. Speaking of Ethiopia, Laura from Samoa is there right now (and by right now, I mean she just left and is in South Africa now). She raves about the food and coffee. A sign of a delicious cuisine is when you can find restaurants specializing in that food outside of the country of origin. There are, for example, Ethiopian restaurants all over the US. I have never seen a Kenya restaurant. I am just putting that out there. Every morning, thousands of insects commit hari-kari on our back porch. Well, Nelly still exists here, and is playing a show this weekend downtown. I find it to be a recurring theme that any time a coffee buyer or roaster I know travels to a coffee growing country, the growers have no idea how to roast or prepare the coffee. If they roast it its always under or over roasted and the resulting brew is poor, and it's amazing to see the reactions to properly roasted and brewed coffee. I forgot about the tiny shopping carts and how hilarious they looked! Thanks for the humorous remembrance. And your quote about Kenyan cuisine: priceless. I'm borrowing that one for sure. Thankfully, nyama choma CANNOT be found the world over.